Join the Louisville Digital Association for its October gathering featuring author David Knox and axe throwing! 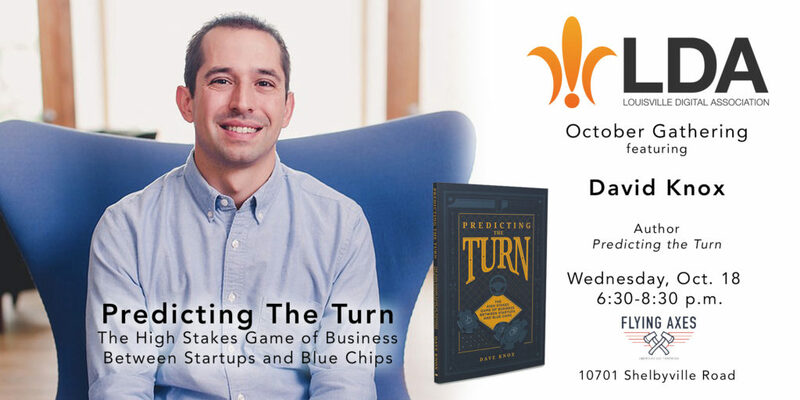 Knox, a veteran of Proctor and Gamble and Managing Director of WPP Ventures, will present his new book, “Predicting the Turn: The High Stakes Game of Business Between Startups and Blue Chips.” The book is sure to open your eyes about the process of building a startup company, negotiating funding and growing a successful venture. The event is Wednesday, Oct. 18, 2017 at Flying Axes in NuLu. Come ready to play darts for grown ups, partake of hors d’oeuvres and learn a little in the process. (Knox is an investor in Flying Axes, but we’re going to be throwing axes! How cool is that?!) Parking at Flying Axes is in their gated lot (the gate will be open) next to the building off Clay Street near the Skate Park. Flying Axes features a cash bar. The food and snacks will be complimentary. Please RSVP as there is limited capacity at Flying Axes. The event is free. Knox will have books on hand to purchase for $20.